Enteroendocrine cells are specialized cells of the gastrointestinal tract and pancreas with endocrine function. They produce gastrointestinal hormones or peptides in response to various stimuli and release them into the bloodstream for systemic effect, diffuse them as local messengers, or transmit them to the enteric nervous system to activate nervous responses. Enteroendocrine cells of the intestine are the most numerous endocrine cells of the body. They constitute an enteric endocrine system as a subset of the endocrine system just as the enteric nervous system is a subset of the nervous system. In a sense they are known to act as chemoreceptors, initiating digestive actions and detecting harmful substances and initiating protective responses. Enteroendocrine cells are located in the stomach, in the intestine and in the pancreas. The very discovery of hormones occurred during studies of how the digestive system regulates its activities, as explained at Secretin § Discovery. Intestinal enteroendocrine cells are not clustered together but spread as single cells throughout the intestinal tract. Hormones secreted include somatostatin, motilin, cholecystokinin, neurotensin, vasoactive intestinal peptide, and enteroglucagon. K cells secrete gastric inhibitory peptide, an incretin, which also promotes triglyceride storage. L cells secrete glucagon-like peptide-1, an incretin, pancreatic peptide YY3-36, oxyntomodulin and glucagon-like peptide-2. L cells are primarily found in the ileum and large intestine (colon), but some are also found in the duodenum and jejunum. I cells secrete cholecystokinin (CCK), and are located in the duodenum and jejunum. 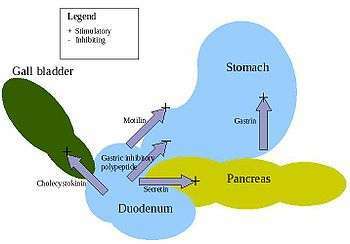 They modulate bile secretion, exocrine pancreas secretion, and satiety. Stomach enteroendocrine cells, which release gastrin, and stimulate gastric acid secretion. Enterochromaffin cells are enteroendocrine and neuroendocrine cells with a close similarity to adrenomedullary chromaffin cells secreting serotonin and histamine. Located in the jejunum, N cells release neurotensin, and control smooth muscle contraction. S cells secrete secretin from the duodenum and jejunum, and stimulate exocrine pancreatic secretion. Gastric enteroendocrine cells are found in the gastric glands, mostly at their base. The G cells secrete gastrin, post-ganglionic fibers of the vagus nerve can release gastrin-releasing peptide during parasympathetic stimulation to stimulate secretion. Enterochromaffin-like cells are enteroendocrine and neuroendocrine cells also known for their similarity to chromaffin cells secreting histamine, which stimulates G cells to secrete gastrin. Other hormones produced include cholecystokinin, somatostatin, vasoactive intestinal peptide, substance P, alpha and gamma-endorphin. Pancreatic enteroendocrine cells are located in the islets of Langerhans and produce most importantly the hormones insulin and glucagon. The autonomous nervous system strongly regulates their secretion, with parasympathetic stimulation stimulating insulin secretion and inhibiting glucagon secretion and sympathetic stimulation having opposite effect. Other hormones produced include somatostatin, pancreatic polypeptide, amylin and ghrelin. Rare and slow growing carcinoid and non-carcinoid tumors develop from these cells. When a tumor arises it has the capacity to secrete large volumes of hormones. ↑ Rehfeld, Jens F (1998). "The New Biology of Gastrointestinal Hormones". Physiol. Rev. 78: 1087–1108. 1 2 Solcia, E; Capella, C; Buffa, R; Usellini, L; Fiocca, R; Frigerio, B; Tenti, P; Sessa, F (1981). "The diffuse endocrine-paracrine system of the gut in health and disease: ultrastructural features.". Scandinavian journal of gastroenterology. Supplement. 70: 25–36. PMID 6118945. ↑ Ahlman, H; Nilsson, (2001). "The gut as the largest endocrine organ in the body." (PDF). Annals of Oncology. 12 Suppl 2 (suppl 2): S63–8. doi:10.1093/annonc/12.suppl_2.s63. PMID 11762354. ↑ Schonhoff, SE; Giel-Moloney, M; Leiter, AB (June 2004). "Minireview: Development and differentiation of gut endocrine cells.". Endocrinology. 145 (6): 2639–44. doi:10.1210/en.2004-0051. PMID 15044355. ↑ Moran, G. W.; Leslie, F. C.; Levison, S. E.; McLaughlin, J. T. (1 July 2008). "Review: Enteroendocrine cells: Neglected players in gastrointestinal disorders?". Therapeutic Advances in Gastroenterology. 1 (1): 51–60. doi:10.1177/1756283X08093943. PMC 3002486 . PMID 21180514. ↑ Hayes, A. Wallace (2007), Principles and Methods of Toxicology (5th, revised ed. ), CRC Press, p. 1547, ISBN 9781420005424. 1 2 Sternini, Catia; Anselmi, Laura; Rozengurt, Enrique (1 February 2008). "Enteroendocrine cells: a site of 'taste' in gastrointestinal chemosensing". Current Opinion in Endocrinology, Diabetes and Obesity. 15 (1): 73–78. doi:10.1097/MED.0b013e3282f43a73. PMC 2943060 . PMID 18185066. ↑ Sternini, C (February 2007). "Taste receptors in the gastrointestinal tract. IV. Functional implications of bitter taste receptors in gastrointestinal chemosensing.". American Journal of Physiology. Gastrointestinal and Liver Physiology. 292 (2): G457–61. doi:10.1152/ajpgi.00411.2006. PMID 17095755. 1 2 Krause, WJ; Yamada, J; Cutts, JH (June 1985). "Quantitative distribution of enteroendocrine cells in the gastrointestinal tract of the adult opossum, Didelphis virginiana." (PDF). Journal of Anatomy. 140 (4): 591–605. PMC 1165084 . PMID 4077699. ↑ Parker, H. E.; Habib, A.M.; Rogers, G.J. ; Gribble, F.M. ; Reimann, F. (2009). "Nutrient-dependent secretion of glucose-dependent insulinotropic polypeptide from primary murine K cells.". Diabetologia. 52 (2): 289–298. doi:10.1007/s00125-008-1202-x. PMID 19082577. ↑ Drucker DJ, Nauck MA (2006). "The incretin system: glucagon-like peptide-1 receptor agonists and dipeptidyl peptidase-4 inhibitors in type 2 diabetes" (PDF). The Lancet. 368 (9548): 1696–1705. doi:10.1016/s0140-6736(06)69705-5. PMID 17098089. 1 2 Brubaker, P. (2012). "A beautiful cell (or two or three?).". Endocrinology. 153 (7): 2945–8. doi:10.1210/en.2012-1549. PMID 22730282. ↑ Friis-Hansen, L (1998). "Impaired Gastric Acid Secretion in Gastrin-deficient Mice". Am J Physiol. 274 (3): G561-568. PMID 9530158. ↑ Orsmbee, H.S. ; Fondacaro, J. D.3919396 (1985). "Action of serotonin on the gastrointestinal tract.". Proc Soc Exp Biol Med. 178 (3): 333–8. PMID 3919396. ↑ Kitabgi, P; Freychet, P (1978). "Effects of neurotensin on isolated intestinal smooth muscles.". Eur J Pharmacol. 50 (4): 348–57. PMID 699961. ↑ Zverkov, IV; Vinogradov, VA; Smagin, VG (October 1983). "Endorphin-containing cells in the gastric antral mucosa in duodenal ulcer.". Biulleten' eksperimental'noi biologii i meditsiny. 96 (10): 32–4. PMID 6194833. ↑ Kiba, T (August 2004). "Relationships between the autonomic nervous system and the pancreas including regulation of regeneration and apoptosis: recent developments.". Pancreas. 29 (2): e51–8. doi:10.1097/00006676-200408000-00019. PMID 15257115. ↑ Warner, RR (May 2005). "Enteroendocrine tumors other than carcinoid: a review of clinically significant advances.". Gastroenterology. 128 (6): 1668–84. doi:10.1053/j.gastro.2005.03.078. PMID 15887158. Histology image: 11604loa – Histology Learning System at Boston University - "Endocrine System: duodenum, enteroendocrine cells"